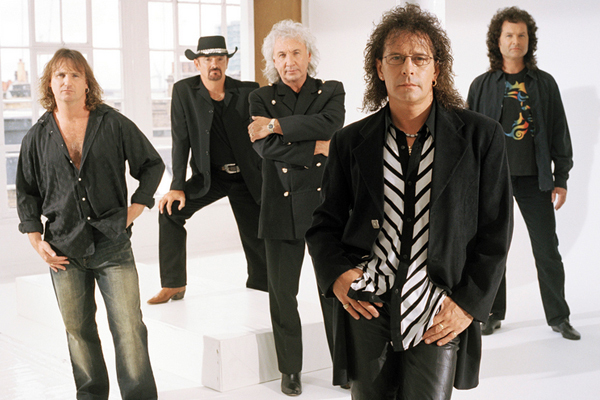 Originally formed in Yorkshire, England, in 1966, Smokie hit the British pop charts several times during the late 1970s with updated psychedelic pop, influenced by the band’s stay on Mickie Most’s Rak Records as well as the writers of most of the band’s hit material, Rak’s Nicky Chinn and Mike Chapman. Vocalist Chris Norman, guitarist Terry Utley, and bassist Alan Silson had played in The Elizabethans, but formed the band Kindness in 1968, with the addition of drummer Pete Spencer. The quartet recorded many singles during the late 1960s and early 1970s, but failed to show any chart activity until 1975. That year, signed to Rak Records and billed as Smokey, the band hit number three in the U.K. with If You Think You Know How to Love Me. After another Top Ten hit, Don’t Play Your Rock ‘n’ Roll To Me, Smokey became Smokie during 1976. The group scored with three Top 20 hits, including the number-five Living Next Door To Alice. Smokie hit number 5 both in 1977 (It’s Your Life) and 1978 (Oh Carol), but the band’s chart run ended by early 1980, and following 1982’s Midnight Delight, they disbanded. Both Spencer and Norman continued to work at Rak during the 1980s, writing hits for several groups. They reformed Smokie in 1988, resurfacing with the LP My Heart Is True. Two more albums, All Fired Up and Greatest Hits Live, followed a year later, with the group remaining active throughout the 1990s, issuing new material as well as a number of hits collections.